The panoramic view is unique, but the accompanying app is poorly designed and subject to frequent crashes. Home security cameras have a couple of ways of maximizing the amount of room real estate they can cover. Ultra-wide angle lenses are the most common solution, but they often cause distortion as they squeeze the image to fit. Cameras with motorized pan-and-tilt features let you sweep the room, but this leaves you turning your back on one part of a room to see what’s happening in another. 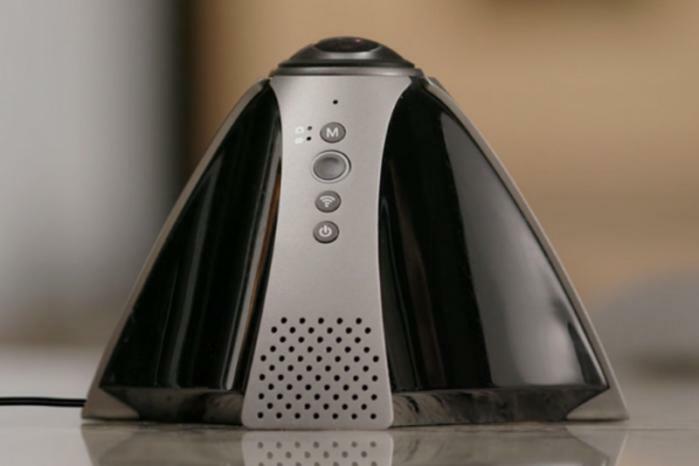 The Guardzilla 360, as its name suggests, pulls off the neat trick of monitoring an entire room all at once. 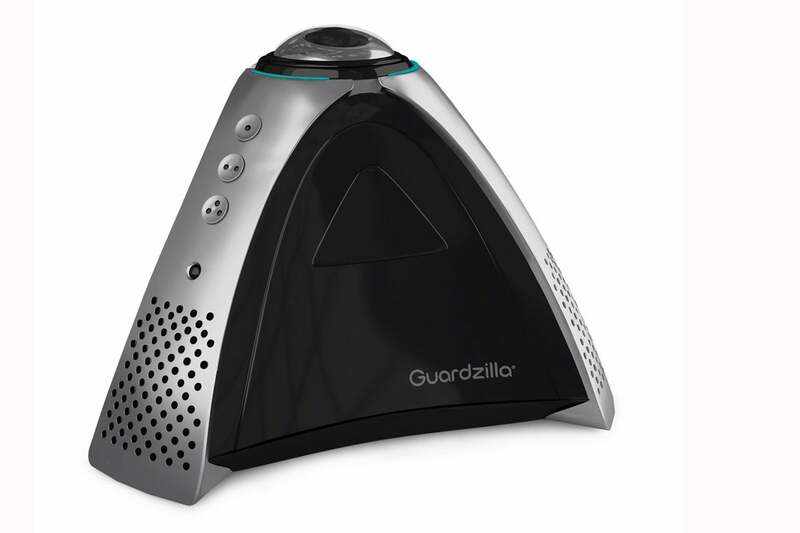 The Guardzilla 360 uses the same pyramid design as the original Guardzilla All-In-One HD Security Camera, but this model is equipped with 1712p HD camera on the top pointing up. It also includes 360-degree PIR (passive infrared) motion sensors to detect movement from any angle, along with night vision, two-way talk, and an ear-splitting 100dB siren that can be set to go off when motion is detected. Three programmable call buttons on the body of the 360 allow people in the house to send push notifications to users’ smartphones. When the Guardzilla 360 detects motion, it records an eight-second video clip of the triggering event. These clips are saved for free for up to two days in Guardzilla’s Video Cloud Storage, from where they can be downloaded to your phone. You can upgrade to a seven-day storage plan for $5 per month or $50 a year, or a 30-day plan for $9 per month or $90 a year. Both subscriptions also extend video recordings to 30 seconds each. The Guardzilla 360's camera points up from the top of the body to give you a panoramic view of the entire room. Guardzilla also offers its own professional monitoring service as an add-on for $10 a month. The Guardzilla 360 works with the Guardzilla companion app, which walks you through the steps of connecting to your Wi-Fi network. The process takes only a few steps and I didn’t encounter any issues. Because of the unique nature of the 360, placing it requires a little more thought than standard fixed-angle cameras. Ideally, you want an unobscured view from all angles, which eliminates mantles, bookshelves and the other spots where you’d typically park a camera. For testing purposes only, I settled on the dining room table. This also solved another potential issue—because the camera is on top pointing upward, you risk cutting off the view of a lower portion of the room if you place it too high. 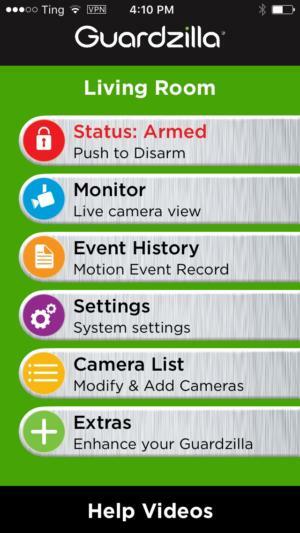 The Guardzilla app's design looks dated and some key controls are nested where you wouldn't expect to find them. 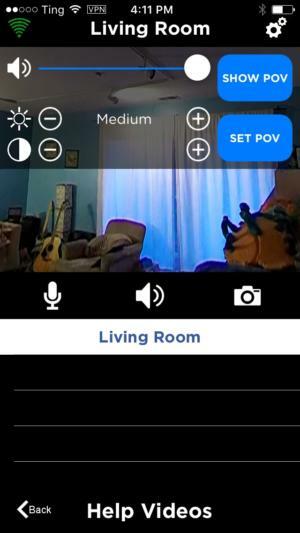 The Guardzilla app livestream displays a panoramic view of the room that you can view by either panning with your finger on your device’s screen, or by leveraging your phone’s accelerometer and moving the phone left or right. Both work, but If panning was smoother with the latter method. When viewing a static view of the room, however, the image shakes slightly from side to side. This was more pronounced when I panned with my finger, shaking more violently between swipes. I eventually determined this is a byproduct of the accelerometer involvement, because it would stop when I set the phone down on a table. It might sound like a minor annoyance, but it can be a significant hindrance when you’re trying to focus in on a certain area of the room. The 360 worked well in other regards. 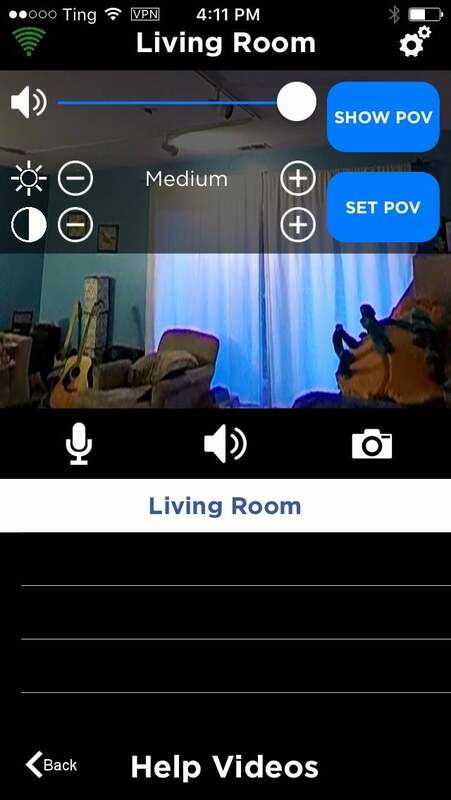 Motion detection was accurate—thanks largely to its use of PIR sensors to detect warm bodies and ignore movement by non-corporeal objects—notifications were timely, and the auto-arm feature, which activates/deactivates the camera based on your proximity to home, operated as intended. The Guardzilla app was more problematic. I used the iOS version, and while the dated design can be overlooked, other quirks are harder to ignore. 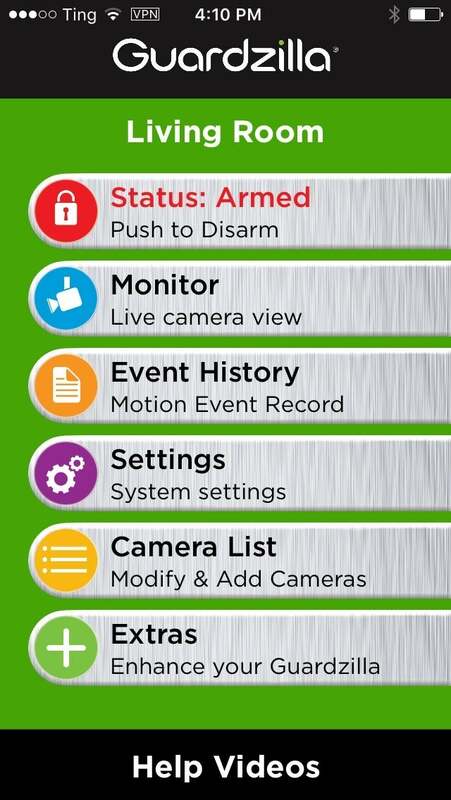 While some camera features--like the livestream, arming and disarming, and event history--are visible and clearly labeled on the home screen, others are obscurely nested in the settings menu. The controls for adjusting the sensitivity of the motion and audio sensors, for example—a feature you usually fiddle with over time—are buried in the Other Settings sub-menu of the general settings menu, along with set-and-forget features like your time zone and account info. Ditto for night vision. It’s also not clear what some features do. A settings icon on the live-stream screen opens a mini control panel with two prominent buttons labeled “Show POV” and “Set POV.” It’s not at all clear from context what these buttons do. It turns out they let you set a starting point from which the camera will start panning. It's not immediately clear what some of the app's controls, like these POV buttons, do which can make using the 360 a frustrating experience. In my case, it hardly mattered because the buttons didn’t work. Neither did the one that’s supposed to let you take a screenshot of the live stream. And the app crashed a lot, sometimes when I tried to change screens and other times for no discernible reason at all. Guardzilla warned that there were “infrequent” app crashes on certain phones, and to just relaunch the app if you encountered them, but that solution wasn’t effective for me. The 360 works with Nest, Samsung SmartThings, and IFTTT, as well as with Amazon Alexa and Google Assistant voice commands. I used it with an Echo Show to arm the camera by saying “Alexa, tell Guardzilla I’m leaving.” This requires you to set up a PIN that you’re prompted to enter each time you ask Alexa to arm or disarm the camera. The first thing to consider is whether you really need a 360-degree view of the room you want to monitor. Most security camera users really only want to keep an eye on small areas of their home—points of entry like front porches and back doors or the rooms where their pet is corralled or their baby sleeps. For uses like this, a fixed-angle camera will suffice. If you decide you really want or need whole-room coverage, the 360 will give you complete coverage, but be aware you’ll likely have to contend with its subpar app until Guardzilla can work out the kinks. The Guardzilla 360's panoramic view can be useful in some security scenarios, but the app needs work to make it a really viable option.